We needed a little Christmas Spirit around here. My mission on Sunday morning was to put up our Christmas tree! I wanted to get it done before Ralph woke up so it would be a surprise for him. For various reason, we didn’t have a tree last year. Because of the fact that the house is in disarray due to our attempts to pack everything up for our move (we’re not organized, if you haven’t figured that out from reading BCDC!!) there is precious little space to put up a tree. I was however determined that this would happen. Our tree is small and we have an antique chest in the living room that is just big enough for the base of the tree. That seemed perfect to me. It was perfect. Here’s our tree, small but filled with Christmas Spirit! I should have taken a picture in the evening, but I forgot to. 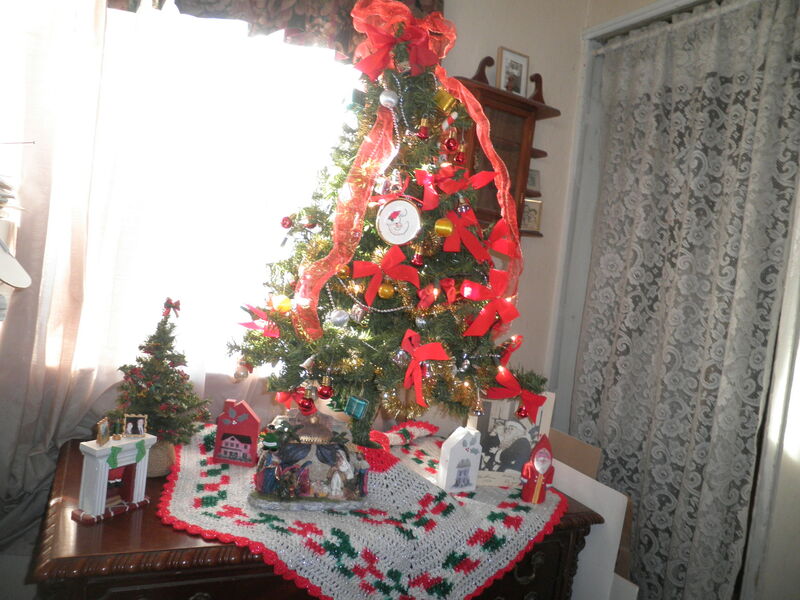 The tree skirt is one that my Mom made for me many years ago. I’m probably going to add a few more ornaments also, but for now it looks perfect. Surrounding it are a few special things. 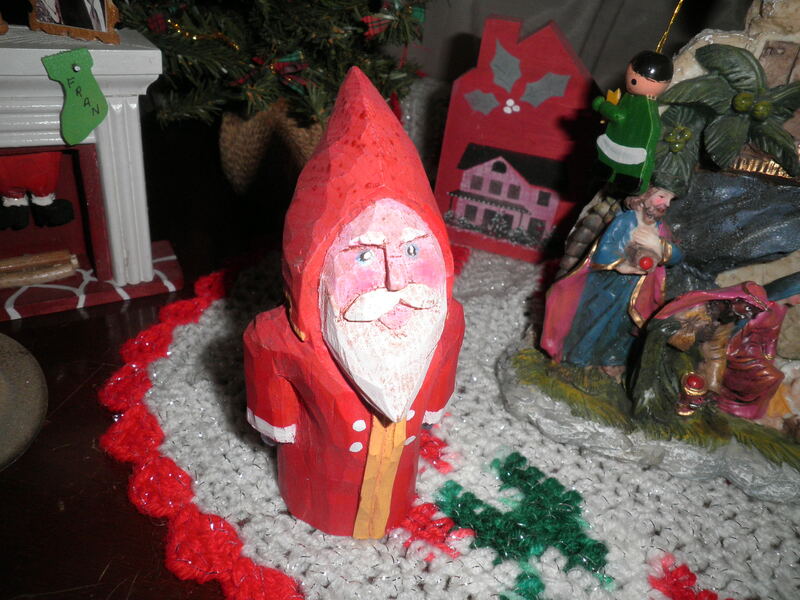 Ralph’s brother-in-law John is a wonderful wood-carver. Each Christmas he gives everyone in the family special carved pieces, sometimes ornaments, sometimes things to sit on the tables. Santa looks a little frightened! It is so cute! 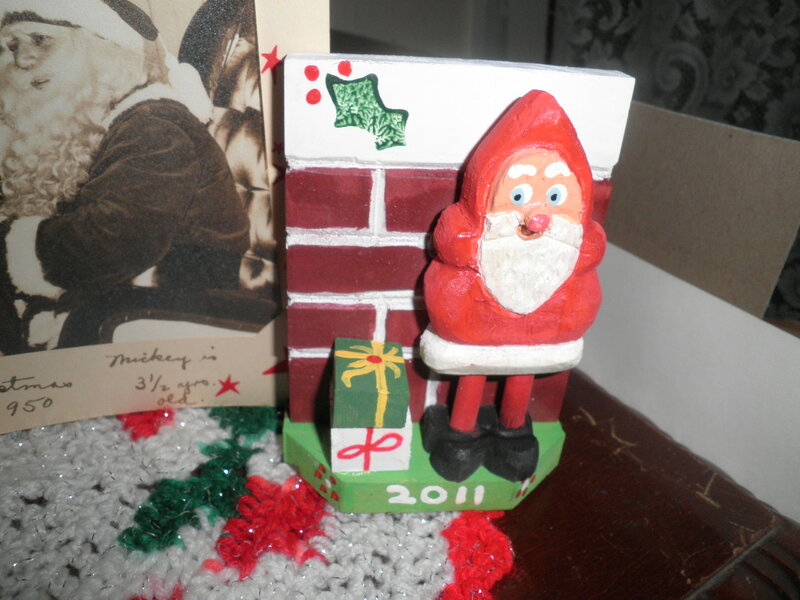 A Santa from a few years ago. 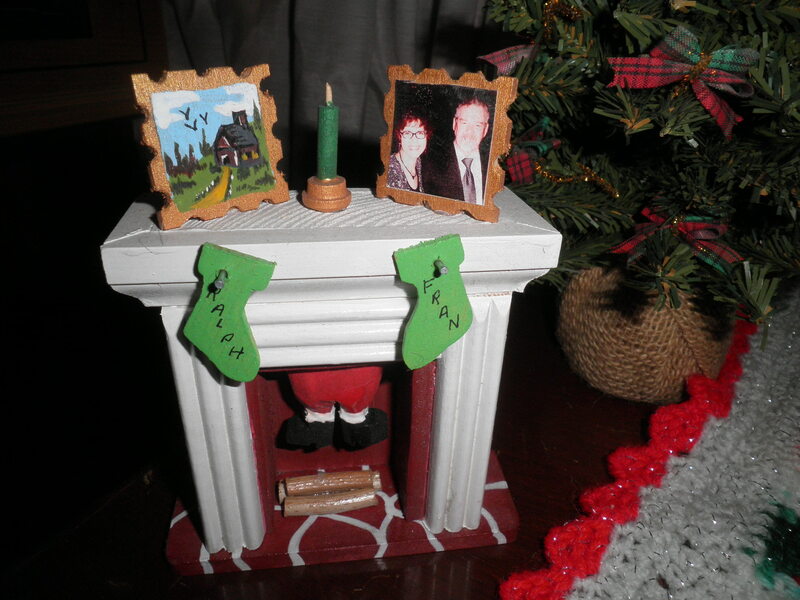 A fireplace and mantle. The moving Christmas stockings have our names on them. There’s a candle on the mantle. The picture on the left it is a little painting to represent our house in New Mexico. On the right is an actual photo of Ralph and me. And in the fireplace itself, it looks like someone is about to make a special guest appearance! This is just so wonderful and I treasure it. Ralph with Santa! 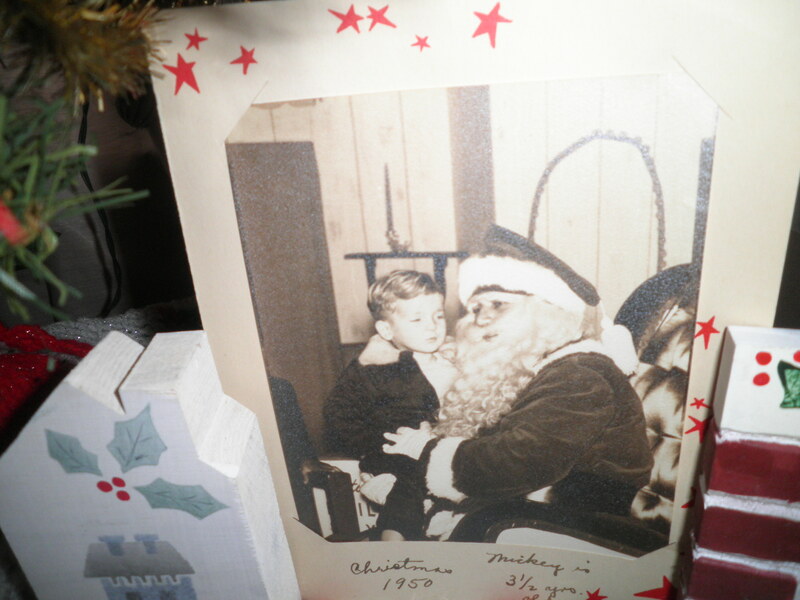 The inscription in his Mom’s handwriting says “Christmas 1950-Mickey 3 1/2 years old.” Ralph’s middle name is Michael, so he was called Mickey as a child. It’s not easy to see, but little Mickey does not appear to be happy with Santa. I have one of me and Ele that I have to find in my Christmas box and put out, too. The best thing was Ralph’s reaction. I was in the bedroom getting dressed when he woke up. He got up and went to the kitchen to turn on his coffee which was ready for him. I didn’t expect him to see it right away. A few minutes later I hear, “Awww, look…we have a Christmas Tree!” He was very happy with it and he gave me a big hug when I came out. He continued to mention throughout the day. In spite of everything, I think we’re going to have a very good Christmas this year. I already got my present. And he wasn’t even wrapped! That is such a nice example of a couple really caring for each other! I love it! Merry Christmas! Thanks, Ginny! I know you understand. Merry Christmas to you, John and Stephanie. We love you!! Thats so sweet, all those personalised ornaments are adorable. Glad Ralph was so appreciative of you putting the tree up, I always think it makes home so much more cosy at this time of year! Thanks, Laura! I was very happy with his reaction and it does make me feel closer to having the Spirit! Love it! This makes me want to start decorating! It is past time, as far as I’m concerned 🙂 Those wooden santas are so cool, and what an awesome Christmas tradition/gift. Thanks, Allie! So glad you like them. I think my brother in law is amazingly talented. He pooh poohs his talent, but I think they’re wonderful and I treasure them! I’m so glad I’m on the list!! Ah, he definitely shouldn’t write off his woodcarving skills. Handmade gifts are always the best, they’re the ones I save and that have the most meaning! Thanks, Allie. I’ll be seeing Ralph’s brother in law at lunch today. I’ll tell him you liked them! How cute! “Mickey” has to be the cutest nickname ever…and how crazy you have that photo! Love it. Thanks, Ameena! I call him Mickey sometimes and he gets that little boy look. He’s really a sweetheart! I love reading about happy, loving marriages such as yours. I feel that when you are focused on making your partner happy it will always come back around to you. Thanks, Marie! I was a little nervous about what his reaction would be. It was exactly right!! Wait till I find the picture of me and my sister. Need to go search that out! Thanks for the reminder! Thanks, Helen! Ralph’s reaction to the Tree was what was so wonderful to me. Merry Christmas!! I love your tree, it’s a happy tree. I have a small tree this year, and it fits just right in front of the window. Wishing you and your family a wonderful, happy, healthy, Christmas. Thanks, Marie! I agree, it’s a happy tree. The important thing for us is that it’s up and it makes us both feel good! Pretty decorations and what a sweet thing for you to do! We haven’t put ours up yet (and the tree is beyond me!). I hope you enjoy your decorated house! Such a sweet post! You and Ralph seem so happy together. Enjoy your tree! Thanks, Stephanie. I was happy with how it turned out. We are happy.